Renal failure uremia is a syndrome of renal failure characterized by elevated levels of urea and creatinine in the blood. The type of renal failure is determined by the trend in the serum creatinine. In renal failure, there may be problems with increased fluid in the body (leading to swelling), increased acid levels, raised levels of potassium, decreased levels of calcium, increased levels of phosphate, and in later stages, anemia. The two main forms are acute kidney injury, which is often reversible with adequate treatment, and chronic kidney disease, which is often not reversible. In both cases, there is usually an underlying cause. renal calculus: A solid concretion or crystal aggregation formed in the kidneys from dietary minerals in the urine; a kidney stone. creatinine: A heterocyclic amine 2-amino-1-methyl-5H-imidazol-4-one formed by the metabolism of creatine. renal failure uremia: Uremia is a term used to loosely describe the illness accompanying kidney failure (also called renal failure), in particular the nitrogenous waste products associated with the failure of this organ. Before dialysis or kidney transplants were widely available treatments, patients with kidney failure had progressive uremic poisoning. These days, most patients have some early symptoms of uremia as their kidney function declines, but prompt dialysis treatments or transplantation avoids most symptoms. Renal failure is mainly determined by a decrease in the glomerular filtration rate, which is the rate at which blood is filtered in the glomeruli of the kidney. This is detected by a decrease in or absence of urine production or determination of waste products (creatinine or urea ) in the blood. Depending on the cause, hematuria (blood loss in the urine) and proteinuria (protein loss in the urine) may be noted. In renal failure, there may be problems with increased fluid in the body (leading to swelling), increased acid levels, raised levels of potassium, decreased levels of calcium, increased levels of phosphate, and in later stages, anemia. Bone health may also be affected. Long-term kidney problems are associated with an increased risk of cardiovascular disease. Renal failure can be divided into two categories: acute kidney injury or chronic kidney disease. The type of renal failure is determined by the trend in the serum creatinine. Other factors that may help differentiate acute kidney injury from chronic kidney disease include anemia and the kidney size on ultrasound. Chronic kidney disease generally leads to anemia and small kidney size. 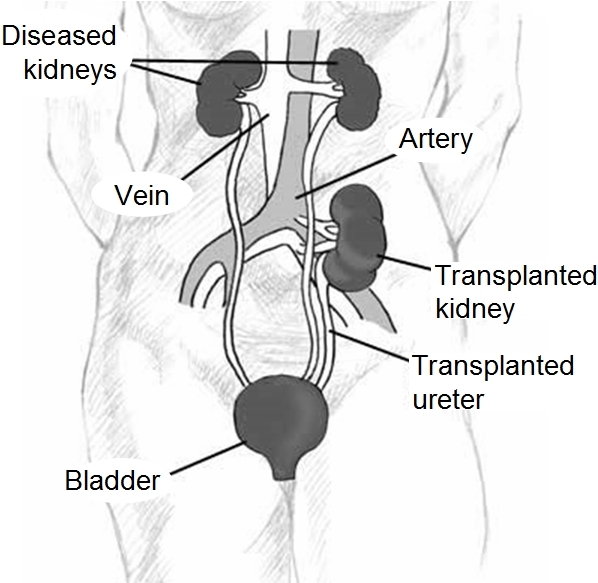 Kidney Transplantation: Kidney transplantation requires a person to be at the end stage of renal failure. Acute kidney injury (AKI), previously called acute renal failure (ARF), is a rapidly progressive loss of renal function, generally characterized by oliguria (decreased urine production, quantified as less than 400 mL per day in adults, less than 0.5 mL/kg/h in children or less than 1 mL/kg/h in infants); and fluid and electrolyte imbalance. AKI can result from a variety of causes, generally classified as prerenal, intrinsic, and postrenal. An underlying cause must be identified and treated to arrest the progress, and dialysis may be necessary to bridge the time gap required for treating these fundamental causes. Chronic kidney disease (CKD) can also develop slowly and, initially, show few symptoms. CKD can be the long-term consequence of irreversible acute disease or part of a disease progression. Acute kidney injuries can be present on top of chronic kidney disease, a condition called acute-on-chronic renal failure (AoCRF). The acute part of AoCRF may be reversible, and the goal of treatment, as with AKI, is to return the patient to baseline renal function, typically measured by serum creatinine. Like AKI, AoCRF can be difficult to distinguish from chronic kidney disease if the patient has not been monitored by a physician and no baseline (i.e., past) blood work is available for comparison. Symptoms can vary from person to person. Someone in early stage kidney disease may not feel sick or notice symptoms as they occur. When kidneys fail to filter properly, waste accumulates in the blood and the body, a condition called azotemia. Very low levels of azotaemia may produce few, if any, symptoms. If the disease progresses, symptoms become noticeable (if the failure is of sufficient degree to cause symptoms). Renal failure accompanied by noticeable symptoms is termed uraemia. Renal failure uremia is a syndrome of renal failure that includes elevated blood urea and creatinine levels. Acute renal failure can be reversed if diagnosed early. Acute renal failure can be caused by severe hypotension or severe glomerular disease. Diagnostic tests include BUN and plasma creatinine level tests. It is considered to be chronic renal failure if the decline of renal function is to less than 25%.